Spring 2019 has already kicked off and it’s time to review the style trends in menswear and womenswear according the 080 Barcelona Fashion designers and brands. Although, more and more often designers tend to present timeless and continuous collections, it’s also true that with an overview of each edition of the 080 catwalk, we can detect trends that repeat themselves in different collections and also spread to the international fashion circuit, from the NYFW to the catwalks of Milan and Paris. One of them for this spring season is yellow. There are many designers for both men and women that introduce designs or total looks in this energic and optimistic color that calls for sunny days. 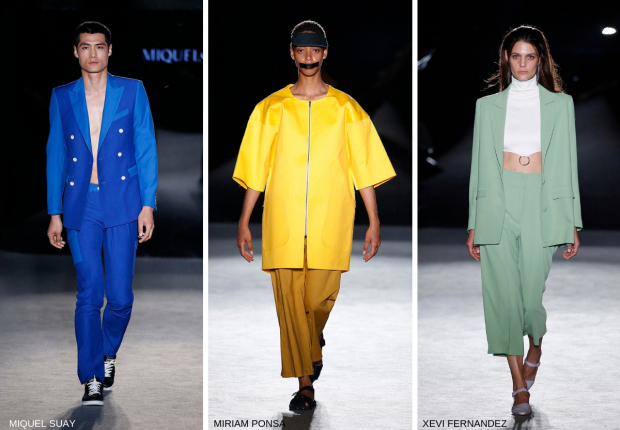 Aubergin, Pablo Erroz, newcomer Teoh & Lea, ES Collection, Maite by Lola Casademunt, Mans Concept Menswear, Miquel Suay, TCN and Miriam Ponsa, who closed her activist spring-summer 2019 show with a poweful yellow look, are the names of the 080 who use the color of the king star, along with Pantone Color of the Year 2019 Living Coral. Those who don’t dare with with yellow, can opt for the elegance of beige, the other color in vogue this spring-summer 2019. This no-color is especially worn with head-to-toe monocolor looks, a very easy to adopt trend that saves many headaches when answering the usual question what do I wear? On the 080 catwalk, we have seen this trend in many versions: chic thanks to emerging designer Xevi Fernandez and his long leather jacket with matching culottes under the knees; casual according to amt. and Lebor Gabala; festive and glamourous with the feminine mark of Sweet Matitos; delicate in the TCN collection; urban in the looks by Antonio Miro and Maite by Lola Casademunt… A proof of the versatility of beige, a hue that reigns this season. A look for the boldest are the suits in unexpected color, away from the classics black, white and grey. The office and workwear won’t be so boring this spring thanks to this trend so well represented on the 080 runway with the likes of Pablo Erroz, with an oversize bright yellow suit; Xevi Fernandez, with an oversize jacket with matching culottes worn alongside a white sixties cropped top; and Txell Miras, in red and her particular contemporary style. Brands like Lebor Gabala, Aubergin and Maite by Lola Casademunt, with a feminine version in mauve, are other names that present this colored suits for spring 2019. As for the party look of the season, feathers and fringes are the main trend. To decorate the most special skirts and dresses, we’ve seen these elements in the collections by Custo Barcelona, Sweet Matitos, TCN, Ze Garcia and Pablo Erroz. Regarding textures, net and the craftsmanship of macrame are also fashionable this spring-summer 2019. In the 080 Barcelona Fashion catwalk, designers that have made craftsmanship their signature like Manuel Bolaño, 113 Maison and Miriam Ponsa are good representatives of this trend along with others like Antonio Miro and emerging brand Killing Weekend. As for menswear, this spring 2019 the double breasted blazer is back. It’s a style that reigned in spring-summer 2017 among the most stylish men. The difference is that now it’s worn in a more relaxed way and looser fit, as seen in the Miquel Suay show, one of the best exponents of this fashionable look on the 080 runway. Mans Concept Menswear and Antonio Miro also included double breasted blazers in their collections, each in his style. Following with the tailoring of the season, a trendy detail for an updated look is wearing your suit wrap-around, be it a obi kimono style as seen in Etro or with a knot as in Cerruti and Martin Margiela. On the 080 catwalk, the winner of the Best Emerginf Design collection by Mans Concept Menswear introduced his version of this trend, showing the vision of its young designer Jaime Alvarez in knowing what the man of today wants.